A Zen Cart™ mod which allows you to suggest upsells on the shopping cart page and on the first page of the checkout process. Note: Big Upsell is the "Checkout Candy" for Big Chooser, Big Spender, Discount Chooser and Discount Spender. If you're not using one of these modules, you don't need Big Upsell. If you're using Better Together, look at Checkout Candy for Checkout Candy for Better Together. If you're using Combination Discounts, look at Checkout Candy for Combination Discounts. 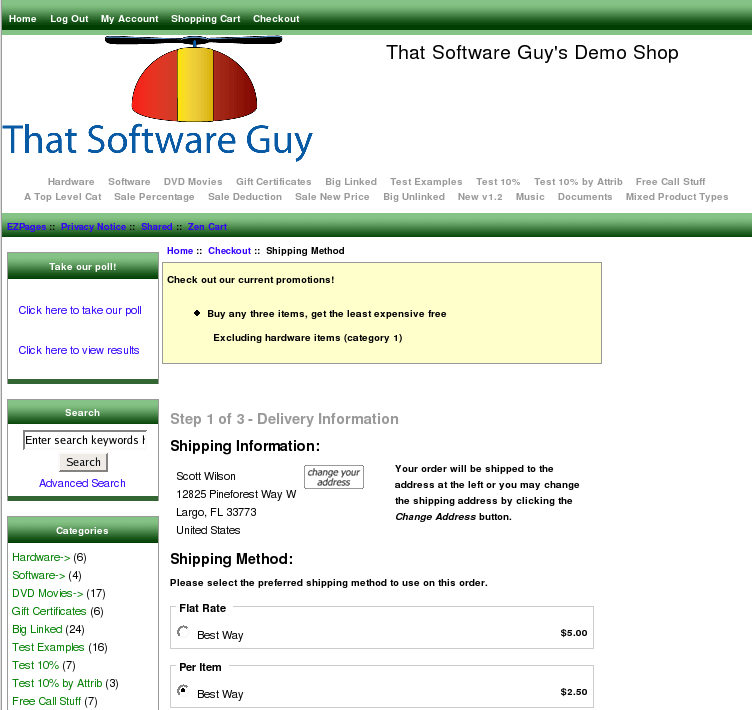 See it Live: Go to my test cart and add this product to your cart. You will notice that on the shopping cart page (and the first checkout page) that Big Upsell re-enforces the discount I have specified using Big Chooser. Big Upsell allows a Zen Cart vendor an upselling opportunity at the two key decision points in the checkout process: when reviewing the cart and on the first page of checkout. Like Discount Spender, Discount Chooser, Big Chooser, and Big Spender? Wish you could re-enforce the upsell message off the product info page? 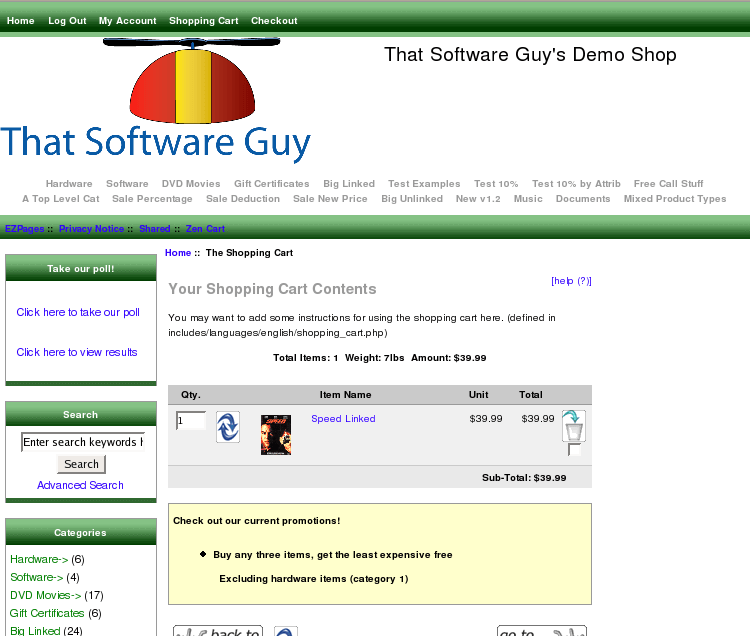 Big Upsell shows your discounts on the most critical pages - the shopping cart page and the first checkout page. This is different from the marketing information provided by Discount Spender, Discount Chooser, Big Chooser and Big Spender on the product info page, since it shows all available promotions, not just ones which apply to a particular product. Here's another example from a client who offered specific products for free over certain spending thresholds using Big Spender. Big Upsell is different from Checkout Candy, in that Big Upsell displays all available promotions from Discount Chooser, Discount Spender, Big Spender and Big Chooser, whereas Checkout Candy tailors them to your cart contents. The information displayed by Big Upsell is what is shown in the Big Spender Discount promotional page, plus the information shown in the Big Chooser Discount promotional page. You can read about these pages in in the Promotional Pages help. A set_group statement was used, and you are not logged in and in that group. A set_coupon statement was used, and you have not entered that coupon. For Discount Chooser and Discount Spender, any discount not requiring a coupon is available. 1.2 - 07/19/2014 - Updated for Zen Cart 1.5.2 and 1.5.3. I charge a $30 fee for Big Upsell. Buy Now!